Time is moving faster than ever in rock ‘n’ roll or so it seems as we hit the spring of 1949 and that’s creating a vortex of artists and records all clamoring to be noticed. By this stage of the game there’s no more uncertainty as to the commercial viability of rock ‘n’ roll, not when the charts are jam packed with rock hits in any given week. We’re now well past the recording ban that slowed artistic advancement throughout 1948 and as a result over the past three months we’re seeing the most sustained rate of high quality records coming out that we’ve encountered to date. But it just so happens that those three months coincide with the absence of any new records by the standard bearers of the vocal group scene in rock since its launch as a genre back in the latter half of 1947. Surely that’s just a coincidence… right? Of course it is. It HAS to be. I mean, The Ravens were the one rock act who were actually making headway in a broader landscape than merely the fervent rock community, as back in January they’d become the first rock artists to make an appearance on Ed Sullivan’s hit TV variety show, Toast Of The Town. They’d toured the East Coast for the past few months selling out theaters along with other well established acts like Dinah Washington with whom they shared a recent cover of Billboard magazine, another notable first for a rock aggregation to be given that prominent a spotlight by the pre-eminent trade magazine that had otherwise largely ignored rock outside of the mere one line reviews they gave all records regardless of genre. Surely all that proved they were in great shape going forward, arguably the signature artists in all of rock, at least to the broader populace. Their eight hits to date are more than any other rock act can claim and their popularity was further confirmed by their strong showing in a Billboard college poll where they finished fifth among vocal groups… keeping in mind that it wasn’t black colleges that were polled, so they were making serious headway with young white kids looking for kicks in the more accessible sides rock ‘n’ roll had to offer, making it one of the first confirmable indications of rock’s early crossover appeal. Ahhh, but maybe that was a telling sign unto itself and a manifestation of the split personality the group found itself struggling with ever since their breakthrough back in the fall of ’47. With more rock acts on the scene than ever, most of whom weren’t compromising their musical output in the attempt at swaying audiences outside the core constituency, were The Ravens with their regular forays into blander pop material and their dreams of so-called mainstream success really necessary for the survival of the ROCK genre anymore? Moreover, were they even still relevant? Let’s try and be perfectly fair about this by considering this question from the perspective they had in 1949. We can decry their mainstream aspirations in retrospect as being almost disloyal to the core young black fan base of rock at the time, but it wasn’t until rock itself changed the rules that the goal of ALL artists, black and white, was to reach as wide an audience as possible and in the late 1940’s that meant appealing to white adults. 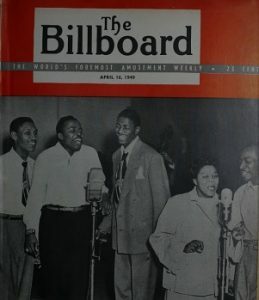 In other words they weren’t doing anything differently than what all other acts had done, including the venerable Louis Armstrong, Duke Ellington, The Ink Spots and recent tour-mate Dinah Washington. The only difference was that going forward the biggest sign of success would no longer be determined solely by an artist’s ability to reach across racial and generational lines but rather – and again thanks to rock’s strong sense of identity – their ability to consistently meet the expectations of their OWN growing fan base which would grow ever more powerful by the day. The Ravens couldn’t be expected to know this and so to be fair we have to cut them some slack. That’s one reason we keep harping on the term CONTEXT here on Spontaneous Lunacy. You can’t judge the past by present barometers any more than you can determine what’s worthwhile today based on previous standards long since obliterated. For The Ravens who were navigating the constantly shifting terrain of the late 1940’s music scene without benefit of an up to date map that foretold of the unexpected turns along the route to lasting acclaim, their road was now being overrun with new, more streamlined hot rods who blared their horns at them as they roared by, jeering them for hogging the fast lane when their career seemed, at least to some more aggressive competitors, as if it were in the process of slowing down. Thanks for getting us to this point, these up and comers seemed to be saying, now get the hell off the road and let us get by. Emblematic of this was the other side of this record, something they (either National Records, manager Ben Bart or The Ravens themselves) viewed as a viable move at this point yet which proved that they totally didn’t understand their market in the least. The song in question was The House I Live In, which taking into account the full circumstances of the artists, the era and the cultural and musical landscape of the day, was arguably the single worst release any legitimate rock artist ever put out, past, present or future. Just so nobody thinks I’m being unreasonable let me start by saying there is a time, a place and a context for such a song where it might be seen as being more legitimate. When the song was written in 1942 America was just entering a World War and patriotic sentiments were understandably at a fever pitch. It was a time when most were willing to put aside the complaints over multitude of inequities that the country brazenly perpetuated – racially, economically and in terms of gender – and focus instead of defeating an imminent threat from an even more dangerous outside entity. In that context the sentimentality and heartfelt sincerity in delivering lines about “What America is to me” were far more excusable. But now seven years later with the Axis vanquished nobody with any intelligence could swallow such hogwash since America was back to shamelessly engaging in many of the same reprehensible racially prejudiced acts they’d decried in Adolf Hitler and so in this current context of 1949 those lines delivered by these four black men took on an entirely different and unsettling meaning, yet one which The Ravens seemed naïvely unaware of. Now ironically the song was originally written and performed in the play Let Freedom Ring as a screed AGAINST racism. No less an icon than Paul Robeson sung it as would a lot of other prominent black artists over the years precisely because its writers were idealistically trying to paint this as the America as it SHOULD be. But as we know what should be is often rarely so and proof of that was found when it was used as the centerpiece of a 1945 short film starring Frank Sinatra which spoke out against anti-Semitism. But in that rendition the line of the song which the filmmakers intentionally removed (much to the consternation of its writers it needs to be pointed out) was one ending with “my neighbors white and black“. By removing it Hollywood bowed to an even greater evil in a perversely reprehensible way, essentially saying let’s decry prejudice against Caucasian religions while purposefully denying the same consideration for racial minorities facing a far harsher and more brutal form of oppression! 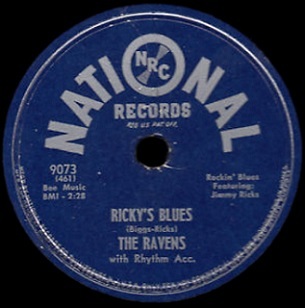 By 1949 the inequities perpetuated by America society hadn’t ceased at all and as a result this song (especially with that same line excised) which had once been held aloft as progressive was now viewed as downright offensive to The Ravens’ audience and to the group themselves as human beings. Instead of it still being taken as something which offered hope for a better tomorrow the interpretation of its meaning had changed completely due to the ongoing failure of those hopes to come to fruition and was now seen as almost taunting those who’d been victims of American greatest hypocrisy. The Ravens either were ignorant about the shifting feelings of their own community or National Records was going full steam ahead in their quest to re-assure white America that the group were nothing to be feared. But in recording it oblivious to the realities of the day they not only compromised their own musical integrity far too often with their concessions to white pop frameworks, but now were pandering to them in a cultural sense as well. Needless to say this did not sit well with the fans whose unwavering support had gotten them this far to begin with. When the group performed the song at the Apollo Theater in Harlem where as local returning heroes they were normally viewed as deities, instead of being cheered or even mildly applauded they were booed mercilessly, eliciting bitterly poignant responses to that same line about what America is to me… “Not a goddamed thing!” was one appropriate reply. So you see, now the question about their standing in the rock universe might make a little more sense and it was becoming ever more precarious by the minute. The days of The Ravens having the stage to themselves were long over. The stylistic compromises they’d been able to somewhat get away with in the past were no longer going to be as acceptable to an ever more savvy fan base and so now more than ever it was vital that they do everything possible to consolidate their standing within the rock community. Luckily for The Ravens there was still one not-so-secret-weapon they could always rely on to right the ship. They could turn things over to the most powerful voice in all of rock and let Jimmy Ricks save the day as he had for them so many times before. All things considered they probably couldn’t have drawn up a better game plan after putting themselves in such a hole with their recent moves, as the title of this song leaves no doubt in listeners minds just who they were dealing with – Ricky’s Blues – and as the song unfolds the performance clears up any questions regarding their allegiance to the style for which they were still best suited, namely rock ‘n’ roll. Drums and piano kick this off, joined by a faintly country-sounding electric guitar, all of which gives it a little momentum heading into the vocals even though the arrangement of the instruments still hints too much at past glories that were fast becoming outdated. In many ways this is a pastiche of their better work they’d made their names on, though it conceivably could be viewed as a culmination of that work as well, your perspective depending largely on just how tolerant you were of the similarities to past hits. Melodically there are hints galore of their breakthrough Write Me A Letter and its sequel Send For Me If You Need Me without quite rising to the level of self-plagiarism. That they don’t strictly adhere to the earlier framework after copping the same hook helps in that regard but it’s still clear they were taking no chances with this or else they were rapidly running out of new ideas in this realm. The plot has Jimmy Ricks despondent over the loss of a girl, his money… and his clothes of all things (don’t get your hopes up, it’s not because he gets lucky with a dame). Though the particulars are all pretty well drawn there’s also no real investment in the character’s plight because we aren’t given a set up. Instead we’re dropped in the middle and expected to sympathize with Ricky based on the hang-dog charm he exhibits within. To some degree that certainly works. Ricks was always an effective actor who knew how to turn a phrase for maximum impact and he doesn’t disappoint here. He’s the kind of guy who if he tells you a story you feel compelled to listen and that goes a long way towards getting you on his side before you even hear the particulars, which in this case includes losing all his dough betting on the horses. This is undoubtedly the most gripping part of the song vocally as he moans his way through the details while the others harmonize nicely behind him, all of them dropping out dramatically when Ricks delivers a stop-time interlude that’s very solid. What we’re most impressed with, and relieved about, is the fact they can still deliver the goods vocally in this style, something that should go without saying they’d be able to do but which is always going to be called into question the more frequently they stray from this approach for something more palatable to those who wouldn’t consider their rock output worthy of admiration. But as well as it’s sung, even as decent as the theme itself is, the song can’t shake the suspicion that this was a calculated affair. Something designed simply to get them a guaranteed response. There’s nothing original about it, no new wrinkle to give you the sense that they were working at coming up with something as vibrant as what they’d debuted a year and a half ago. 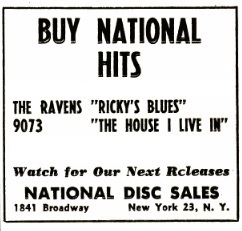 In many ways Ricky’s Blues IS what they came up with a year and a half ago when you get right down to it. It may still be enjoyable to hear, still be appropriate in terms of the type of material and delivery that is most likely to connect with the rock audience, but it was no longer vital. Songs like this, and The Ravens themselves, were simply no longer at the cutting edge of rock. The song closes out with lines that SHOULD’VE been prescient but in fact – if taken literally – what they really showed was that they weren’t paying attention to their own lyrics or the context of their own successes. Theoretically they may have known that’s what the problem was and knew enough to head back to their more appropriate surroundings. 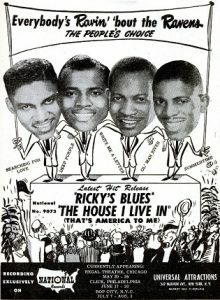 In this song, certainly a throwback performance if ever there was one, they saw that it worked too, as Ricky’s Blues became their ninth hit and proved once again that when they stuck to rock the audience stuck with them. But it was a lesson they didn’t learn well enough because it was also their last hit for awhile and far from being just a case of missing the charts they were now increasingly missing the target completely when it came to their releases. Though by no means finished as a competitive and important rock group and with even with some notable releases to follow this, their glory days – the time when they were shaping rock – were now reaching an end. The choices we derided all along regarding their divergent aims had done them in. By not giving themselves over fully to conquering the rock universe and being content with being the biggest ones on that block before the neighborhood expanded, they now find themselves in a constant scramble to merely keep up with those who learned from the lessons The Ravens had too often ignored. Previously, I’ve been quite kind to Ravens’ pop ballads (not yet understanding that you were grading those records by rock-and-roll’s vastly different standards). 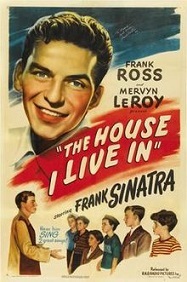 But, even using pop-music standards, I still detest “The House I Live In. While I generally find the so-called Make America Great Again movement intolerable, I might detest its counter movement even more. I fundamentally disagree with those proclaiming that America’s Already Great, a slogan that wallpapers over all of her transgressions and works to silence any critics before they even open their mouths. To me, “The House I Live In” feels like the musical personification of the America’s Already Great idea. This song is a slap in the face to anyone who’s ever faced discrimination or bigotry in the country (especially prior to the Civil Rights Movement). Shame on the Ravens (and/or their handlers) for being desperate to appeal to “mainstream” audiences at the expense of their dignity. I’d like to apologize for getting a tad political here, but I abhor this song. I guess I should say something about “Ricky’s Blues” now: it’s okay. It’s clearly meant to invoke “Write Me a Letter,” “Send for Me,” “Bye Bye Baby Blues,” etc. It mostly succeeds, but there’s nothing especially notable about the record. In fact, it sounds like they’re just trying to get back to where they were in 1947-48 while everyone else is taking bold leaps forward. Leave a reply on "The Ravens: “Ricky’s Blues”"